With as much as $60 trillion in future spending expected across the resources industries, companies still struggle to deliver projects on time and budget. Above the Arctic Circle, workers are toiling to build a 300-mile pipeline that will run from Siberian oil fields to Purpe in northern Russia. Begun in 2012, the project is scheduled to be completed in three stages by late 2015 at an estimated cost of $3.8 billion. This is just one among a host of projects that are planned around the globe in the next 15 years or so by companies in the utilities, energy, metals, mining and chemicals industries. By some estimates, they represent a total investment of $60 trillion—more than the combined 2012 GDP of the European Union, the United States, China, Japan, Brazil, Russia and India. With the stakes so high, getting these projects right is especially critical. Other industries make large capital investments, of course. Telecom players worldwide are currently investing billions as they introduce high-speed mobile 4G technology or build fiber-optic fixed networks, and the global automotive industry routinely spends massive amounts to retool existing plants or build new ones. But delivering capital projects on time and on budget is proving more difficult than ever in sectors like energy and chemicals. The reasons center on today’s riskier, rapidly evolving business environment. For example, nearly two-thirds of this money will be spent in less developed countries, which can make many aspects of a venture more difficult. Projects are also growing larger and more complex; meanwhile, commodity markets and the broader macroeconomic environment have become more volatile and uncertain. A shortage of experienced talent adds to the challenge, especially as more projects are centered in remote areas, where skilled labor is sometimes used for the wrong tasks. For instance, engineers might have to push paper, filling out forms required by headquarters rather than engaging in critical development and problem-solving activities. And all this is happening against a backdrop of regulations and national policies that are constantly subject to change. This is the picture that emerges from an Accenture multi-industry capital investment research initiative that involved 101 executives in oil and gas, chemicals, metals, mining and utilities in more than 25 countries (see Sidebar). Among the other findings: Just over a third of respondents reported that their companies remained within 25 percent of their approved budgets for all projects. That means almost two-thirds missed the mark by that amount at a minimum—and sometimes by much more. When spread across the anticipated $60 trillion outlay on capital projects that these industries will make, the value at risk and the cost overruns resulting from poor execution could run into trillions of dollars. Our research told us that a number of challenges were similar across all of the industries. 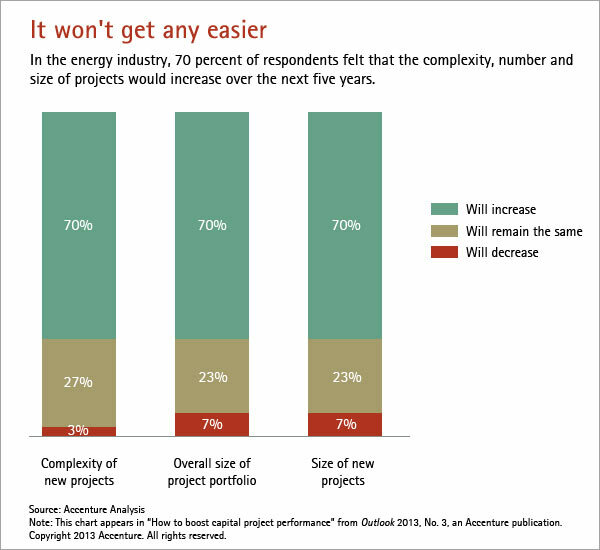 Many companies struggled to keep their capital projects on schedule. Only 15 percent of energy sector respondents, for instance, said that they stayed within 25 percent of their approved schedules on all projects. Roughly a third of chemicals, metals and mining companies reported similar results. When asked to identify the major challenges to completing projects on time, respondents cited regulatory requirements and financing problems. Talent shortages were also a major concern. When it comes to projects in remote areas, executives added that attracting and retaining project directors and other key talent is difficult. Burnout and time away from home play havoc with retention rates, undermining project management capabilities and a company’s ability to deliver projects as planned. Meanwhile, multiple factors—including the economic downturn, burdensome local regulations and a lack of clarity on energy and environmental policies—have made financing more difficult in recent years. As a result, the impact of a single large botched project or a broader project portfolio trend of delays and cost overruns can quickly exacerbate a company’s problems in obtaining capital project funding. One result is that financing costs have risen in the past two years for more than half of the utility respondents; other industries have felt the squeeze as well. As in all industries, there are companies that are more successful at overcoming common problems. So what do the leaders in these sectors do differently from their peers? For one, they make significantly fewer changes to the approved schedule during the construction phase of these capital projects, which inspires greater confidence and feeds the culture of project delivery excellence. They employ more automated tools like “war room” dashboards that offer leaders virtually real-time information to help them monitor performance and make decisions. They also make wider use of advanced analytics (including key performance indicators, or KPIs), and ensure that the organization has better access to performance data across multiple dimensions (for example, timeliness, accuracy, range and sources). 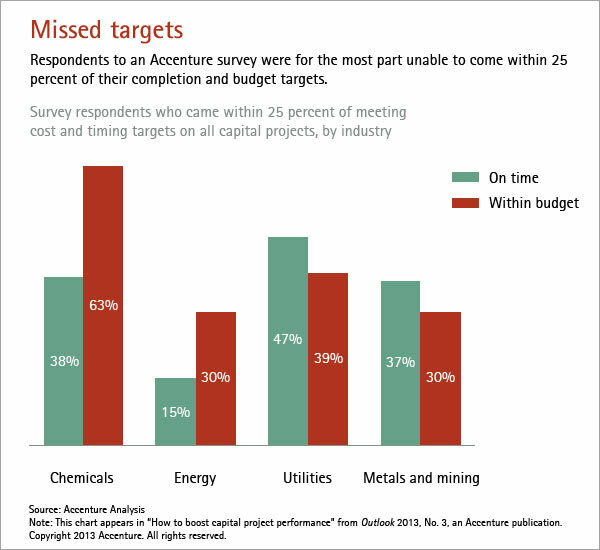 According to our research, among utilities, energy and chemicals companies, leading players outperformed the field in meeting internal targets for cost, schedule, quality and the delivery of reliable production capacity. Companies in this group made significantly fewer changes during the construction phase. They also effectively managed the transition from a capital project to an operating asset due to their superior upfront planning as well as the ability to transfer engineering data, information and assets from the project phase to ongoing operations. And they maintained a well-developed culture of project delivery excellence, made decisions in a timely and efficient manner, and used an integrated project management approach that included guidelines and tools. In the energy and chemicals sectors, leading players used safety and delivery KPIs on all projects, while lower-performing companies did not. They also paid significantly more attention to external stakeholders’ KPIs, making sure the metrics used by contractors and employees aligned with the company’s own performance indicators. To gauge the savings companies could capture by improving their performance in capital project delivery, we examined the potential impact it could have in different industries. In the energy industry, for instance, expected incremental savings from implementing best practices ranged from 10 percent to 15 percent. A company investing $100 billion in capital projects over the next 20 years, for example, would expect savings of between $10 billion and $15 billion. Utilities could expect an average incremental savings of about 13 percent, which translates into $2.2 trillion of the $17 trillion the sector is expected to spend on capital projects through 2035. We believe company leaders across all of these sectors can take four important steps to capture this sizable source of value. Following these steps would be essential to the success of a major capital investment in virtually any industry. However, given the orders of magnitude of the projects, they are especially critical in the resources sector. As resources companies reconsider their engineering, procurement and construction (EPC) models and assume greater control over the way they execute large capital programs, they need to establish strong portfolio and project governance policies, and manage risk and uncertainty more effectively. At the start of a project, uncertainty levels are usually quite high due to the large number of assumptions managers typically make concerning major aspects of the work ahead, including work scheduling, labor availability, logistics, market variables like commodity prices and interest rates, and issues surrounding the installation and use of new technologies. As the project unfolds, teams need to revisit and update these assumptions constantly and consistently across all affected project areas, which could range from procurement to human resources. Teams need to be flexible so that they can correct problems as they arise, which will require the use of on-time KPIs as well as predictive performance indicators (PPIs) arrayed in a project “dashboard.” This setup can provide managers with real-time information and forecasts, enabling better decision making compared to the traditional use of less frequent end-of-period reports. Companies should also define project organization roles and responsibilities that align with their corporate strategies, and implement policies and approaches that support collaboration and good governance across their partners, contractors and suppliers. Doing so can help them achieve transparent and smooth transitions through every phase of the project. Key enablers include more comprehensive and rigorous upfront project planning (known in the industry as front-end loading) as well as such innovative contracting strategies as value-based deals or managed services for non-core business processes. Both can help leaders clearly define the project, assign risks appropriately, and ensure that all stakeholders understand their roles and what the company expects them to deliver. Effective upfront planning includes a number of elements. The added complexity of today’s larger projects requires decision makers to put a sharper focus on managing risk at the portfolio and project levels, which means they need to develop robust processes to monitor and deal with those projects. It will also oblige suppliers to make greater contributions, because rising asset construction costs will likely cause managers to concentrate more on ongoing operational spending to reduce the asset’s lifecycle costs. For example, by using advanced analytics and plant performance modeling that link capital and operational spending, managers can more accurately determine whether it makes sense to invest in additional equipment now in order to reap operational savings over the life of the asset. The new contracting strategies that support this goal call for focusing greater attention on vendor capacity, and achieving higher quality levels among first- and second-tier suppliers. Companies should also seek design and delivery innovations while recognizing the constraints caused by local variables, which will probably require a greater emphasis on developing local suppliers. Finally, improved planning enables companies to gather and share lessons learned as well as internal and external best practices. Leading players often create a “capital project services office,” which serves as the go-to organization for ensuring strong governance and the use of robust and common methodologies and integrated systems. This office seeks to maintain maximum transparency and enable real-time collaboration across the project ecosystem. It often includes a project management “war room” that centrally manages the company’s end-to-end project portfolio and serves as ground zero for activities such as talent sourcing, procurement optimization, people and logistics tracking, and claims and contract management. One critical capital project challenge can be characterized this way: “If we build it, will it work as planned?” All too often, it won’t. Given the huge amounts of capital in play, and with small production delays representing millions of dollars in forgone revenues, success requires the seamless and rapid transition from construction project to value-producing asset. This means leaders need to make operational readiness a core project capability, one that includes such components as end-to-end resources planning and governance, progressive engineering and project data handover (to enable asset commissioning), and production ramp-up, maintenance and improvement activities. Data and document handover processes themselves can become a major stumbling block to ramping up operations quickly. This information, often compiled without an appropriate handover structure or in different formats sourced from the multiple systems used by engineering, procurement and construction contractors, suppliers and partners, can be a challenge for the asset’s owner/operator to understand and use effectively. Developing a structured set of handover requirements enables teams to make greater use of systems to validate data. This, in turn, releases the project’s scarce engineering and technical talent to focus on adding value to the initiative instead of wasting time searching through reams of data or documents. The data handover process traditionally takes place in a one-time data dump toward the end of the project. As a result, the asset owner will have volumes of documents in different forms that are distributed among various parties. A much better approach involves a progressive handover, which enables the asset owner to use the information as soon as it’s needed. Doing so creates widespread confidence in the status, consistency and correctness of the information at all times during project delivery. By creating data requirements and structures during the project delivery cycle, managers can effectively bridge the gap between the project itself and ongoing operations. Supply chain operational readiness plays a large part in resolving the challenge of moving from project to productive asset. Take talent, for example. Companies can introduce a supply chain workforce management process that’s capable of developing and transitioning workers from project execution to support. This will require developing effective ways to manage contingent labor needs and local content requirements. The process should include training and the use of effective field workforce technologies, and provide the support services the company needs to manage the assets concerned. Companies need to define a workable model to recruit, develop, reward and retain the talent they need to deliver capital projects on time and within budget. This means balancing internal/external workloads during the project’s lifecycle, which can extend for many years, from the earliest simulations to the execution phase. One solution: advanced technologies to support project teams. Analytics, decision-support tools, and planning and scheduling solutions can effectively amplify the impact of experienced, well-paid resources. In addition, in light of the high turnover rates on some projects, knowledge management systems can improve continuity and bring new people up to speed faster. Given a capital project’s often extensive and complex ecosystem of stakeholders, partners and suppliers, companies need to develop integrated information systems and processes. Better, more relevant and timelier data are crucial not only to enable operational readiness—they also play a key role in making a well-executed project possible. Managers can take the right corrective actions only when they have an accurate and timely understanding of the issues and options related to the project. This means teams must integrate the many different systems responsible for cost and schedule management, engineering, procurement, contract management and human resources, as well as all health, safety, security and environmental obligations. Achieving this kind of integration enables leading performers to set up war rooms that use technology to track and analyze a project’s (or a portfolio of projects’) many KPIs and PPIs in real time, which can result in significant savings through timely and effective decision making. As capital projects grow in size and importance in the resources sector, companies in industries like energy, mining, metals, utilities and chemicals need to reassess their capabilities to plan, construct and commission projects that work as planned, on time and within budget. Given the enormous sums of money at stake, every wrong decision on a major project could translate into millions of dollars in lost value. Leaders in these industries need to make a clear-eyed assessment of their own strengths and weaknesses, and act now to improve their capabilities and performance so that their next capital project delivers on its promise. An independent international agency conducted the primary research that forms the basis of this article. Researchers focused on interviews with executives in the resources sector: utilities, energy (oil and gas), chemicals, metals and mining. Respondents included top executives and other decision makers involved in capital projects. A total of 101 interviews (31 in utilities, 30 in oil and gas, 9 in chemicals, 9 in metals and 22 in mining) were conducted via phone between November 2011 and May 2012. Executives were based in Denmark, Finland, Germany, Greece, Hungary, Ireland, Italy, Luxembourg, the Netherlands, Portugal, Russia, Spain, Sweden, Switzerland, the United Kingdom, China, Hong Kong, India, Singapore, Taiwan, Thailand, Canada, the United States, Brazil, Peru, Saudi Arabia, the United Arab Emirates and South Africa. Omar Abbosh leads Accenture’s Communications, Media & Technology group. He is based in London. James Arnott leads Accenture Capital Project Services for Europe, Middle East, Africa and Latin America. He is based in Abu Dhabi. Michael Grady leads Accenture Capital Project Services in Australia. He is based in Brisbane.